Looking for a solution to your home’s chronic mess problem? 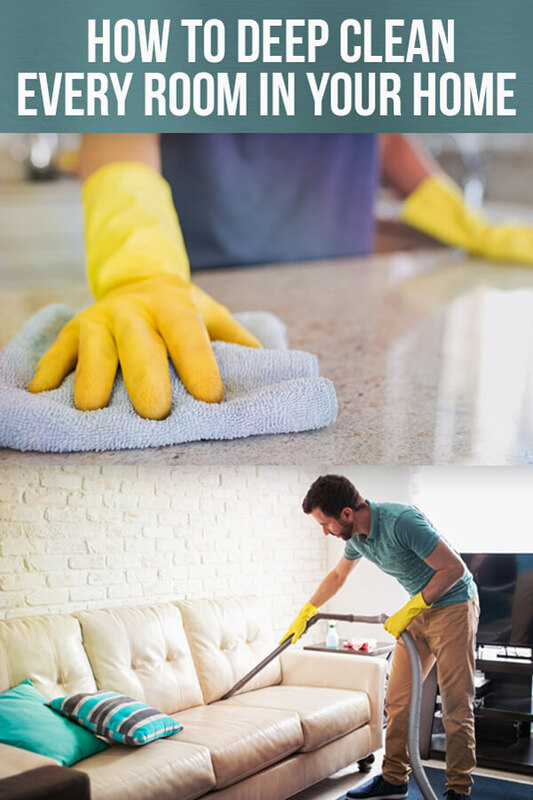 With our room-by-room deep cleaning checklist, you’ll be able to keep your home in tiptop shape throughout the year. We’ll show you all the nooks and crannies that need your attention on a weekly, monthly and seasonal basis. 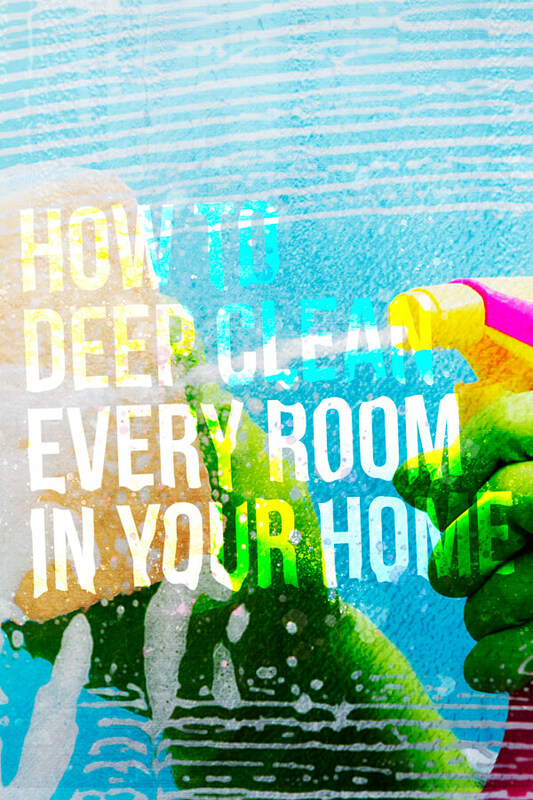 With these deep cleaning tips, you’ll never have to stress over tidying up again. Countertops: Spray down with all-purpose cleaner to keep stains and germs at bay. 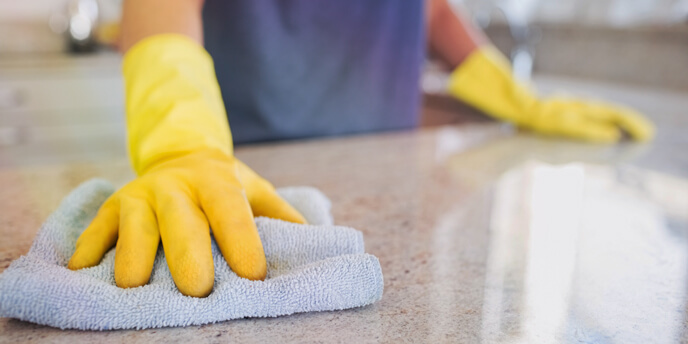 If you have stone countertops, use mild dish soap and water instead. You could also try some of these natural cleaner recipes from Groom+Style. Floors: All you need is a bucket of dish soap and water, and a good mop. Microwave, Stovetop and Cabinets: Wipe down each surface with an all-purpose cleaner or dish soap and water (test cleaners in a discreet spot on your cabinets first). Cutting Boards: Use a small amount of vinegar, then hydrogen peroxide to sanitize your board. Rinse it off, then cut one lemon in half and rub across the board to eliminate any lingering odors. Condition your wood cutting boards with olive or mineral oil to extend their life and keep them looking spiffy. Garbage Disposal: Place 1/2 cup of baking soda into the drain, then pour a cup of white vinegar on top. Let sit for 10 minutes before rinsing with hot water while the disposal is running. Dishwasher: First, make sure there’s no detergent in your dishwasher to avoid making a bubbly mess. Then, fill the dispenser with 1 cup of vinegar and 1/2 cup of baking soda and run it empty. 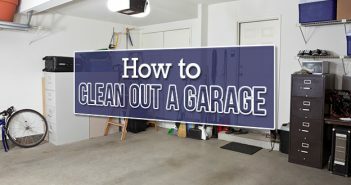 This will clean up any grime or grease inside the appliance. Coffee Pot: Pour equal parts white vinegar and water into the reservoir, then run until half empty and switch off for 30 minutes. Turn it back on until the reservoir is empty. Fill it up again with clear water and let it run with a new filter. Oven: Either use your oven’s “self-cleaning” feature (if you don’t mind smoke and burning odors) or scrub with a combination of baking soda and vinegar. Refrigerator: Remove all containers, throw out expired food and wipe down shelves. Leave an open box of baking soda inside your fridge to absorb all those funky odors. Make sure to swap in a fresh box at the end of every month. All Surfaces: Dust bookshelves, light fixtures and ceiling fans. Carpets and Rugs: Simply run the vacuum over them, making sure you get the corners of the room. Wood Furniture: Clean with a damp cloth dipped in a mild soap, wipe down with a clean cloth to dry and then apply a wood polish to help protect your furniture from stains. Baseboards, Molding and Ceilings: Wipe down with a damp cloth or use the wand attachment on your vacuum. 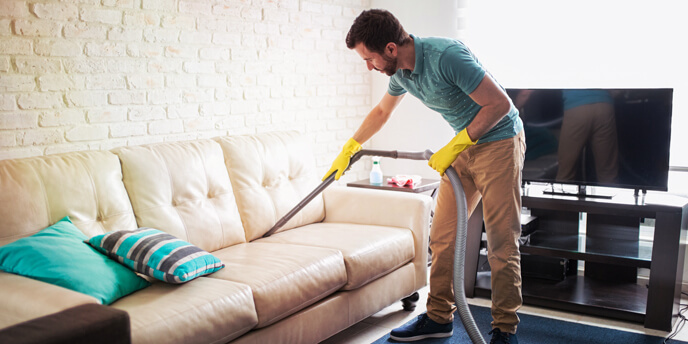 Couch: Use your vacuum’s upholstery attachment to clean under and on top of couch cushions. Windows: Spray with a glass cleaner and wipe down with a squeegee, following a reverse s-pattern. Make sure to wipe the dirt off the blade after every pass. Under Furniture: Clean or vacuum the floor underneath your furniture. Curtains, Drapes and Blinds: Follow the manufacturer’s guidelines for washing curtains and drapes. Clean your blinds using a cloth dipped in equal parts vinegar and water. Carpet: Why carpet twice? While you should vacuum your carpets at least once a week, you should also steam clean them at least once a year to extend their life and improve air quality. Sheets and Pillowcases: Wash according to the manufacturer’s instructions. Carpets and Rugs: Vacuum your bedroom carpet to clean up dust, lint and other debris that you might otherwise miss. Picture Frames and Paintings: Dust any pictures or paintings you have on your bedroom walls. Use the gentle cycle on your washing machine to clean your pillows, then tumble dry with tennis balls to keep them fluffy. Hair and Makeup Brushes: No deep cleaning checklist is complete without including your brushes. For hairbrushes, all you have to do is disentangle and toss out those strands of hair. For makeup brushes, soak in a mixture of water and a mild soap to remove built-up product. Then dry with a cloth, squeezing out the excess moisture. Mattress: Remove odors by sprinkling baking soda on top of your mattress and gently rubbing it in with a scrub brush. Let sit for 10 minutes before vacuuming it up. Closet: Purge your bedroom closet by identifying clothing you no longer want or wear. Use the opportunity to reorganize your closet so it works for your needs. Guest Bedrooms: Dust shelves, nightstands and other furniture. Vacuum carpets and rugs as well. Toilet and Toilet Brush: Add a few cups of washing soda to the toilet bowl and soak the brush for a few hours. Then, scrub the toilet and flush. Leave the brush to dry for a half hour before putting back in the holder. Hand and Bath Towels: Wash towels from last week and replace with clean set. Bathroom Mirror: Wipe down with glass cleaner to remove spots and streaks. Bath Mats: Throw in the wash if made of fabric. Follow manufacturer’s guidelines for other materials. 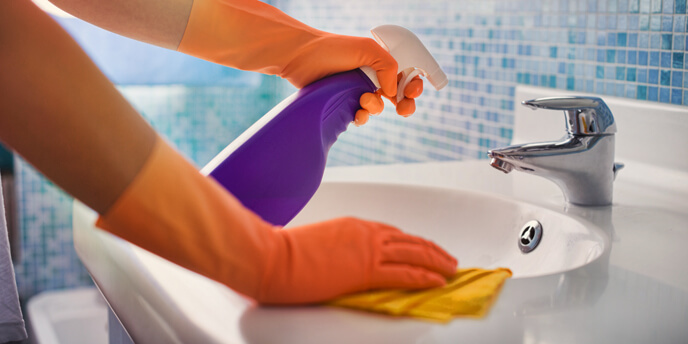 Sinks and Tubs: Deep clean your sinks and tubs by scrubbing with a mixture of castile soap (a few tablespoons) and baking soda (1/2 cup), then rinse. Floor: Mop the floor using dish soap and water, make sure to get behind the toilet! Drawers and Cabinets: Clean out old toiletries and throw out expired medications. Closet: Throw out old carboard soap containers, shampoo bottles and plastic wrap. Reorganize your bathroom closet to keep your toiletries easily accessible. 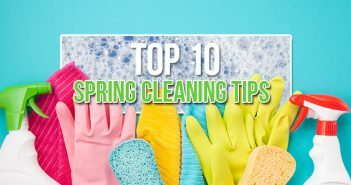 Now that you know how to deep clean every room in your home, read up on these deep cleaning tips and tricks for the most overlooked parts of your home. You’ll be able to impress any houseguest with your immaculately clean abode. Have any other good deep cleaning tips? Let us know in the comments!